These three astronauts are the prime crewmen of the Apollo 17 lunar landing mission. They are Eugene A. Cernan (seated), commander; Ronald E. Evans (standing on right), command module pilot; and Harrison H. Schmitt, lunar module pilot. 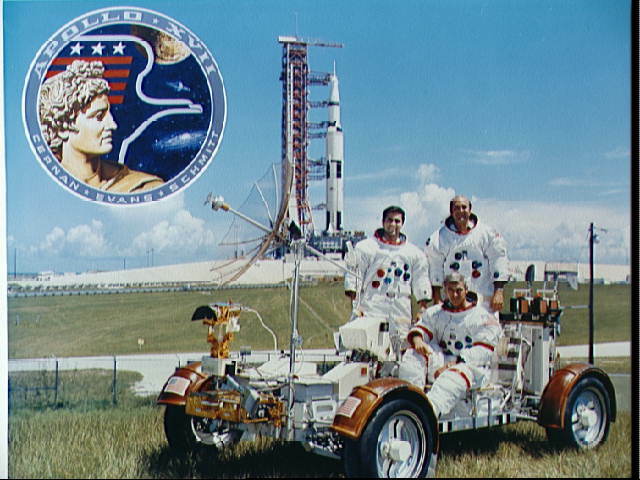 They are photographed with a Lunar Roving Vehicle (LRV) trainer. Cernan and Schmitt will use an LRV during their exploration of the Taurus-Littrow landing site. The Apollo 17 Saturn V space vehicle is in the background. This picture was taken at Pad A, Launch Complex 39, Kennedy Space Center (KSC), Florida, The Apollo 17 emblem is in the photo insert at upper left.